Join the discussion on our forums! Come discuss Cosmic Anomaly over in our dedicated Cosmic Anomaly discussion topic. 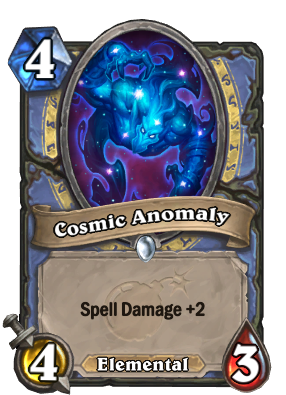 Why is Cosmic Anomaly not considered a Spell Damage minion? Omg the golden version its easily the coolest card of the set!! A long time ago freez mage played a 4 mana 2/2 with spell power +2, but that was due to thorisan and it was a combo deck, the body really didn't matter. This card looks decent, spell damage + 2 is very powerful with simple spells like arcane explosion. This is a scary card. I honestly think this will still be too slow to be seen in meta. The four slot for mage is pretty competitive in what you will fit in and generally you won't be playing this minion for the stats, but for the spell damage. So it is not really a 4 mana minion from my point of view and we already got a better card revealed for that purpose with Celestial Emissary. Fantastic job on the card art design. I was thinking some more about this card and the cards that have been announced so far for mage and i think that a mid range freeze mage with blizzard and frost nova for stalling vs agro (just theorycrafting here, maybe we could be adding some more idk) and Unexpected Results with and spell damage stuff and burn could turn out nicely. Maybe we are going to have add some more sustain and Counterspell to prevent board clears. The question is, can we fit all of this in a deck and have enough card draw to win consistently (aka crossing our fingers we aren't playing vs druid or other classes with strong armor or hp gain). Maybe even a quest mage deck with an alternative win condition could pop up (like giant quest mage, i almost got legend with that). With ice block out it's hard to imagine but, even if it doesn't pave the way for one of those decks, you can just slap this in on an elemental deck and call it a day. Overall a really high potential card with a lot of synergies and great value. Power creep over Evolved Kobold. That card still saw some play though, and it was a neutral card, still, it was mostly garbage, so I think this power creep is fine. Oh wow, a spell damage minion with actually decent stats. I knew you could do it Blizzard. Because it needs to be both easier to kill and control mage probably won't use it. I just don't see the hype for this. The only difference to Evolved KObold is that the stats are better, but nobody is going to let this survive a turn anyway, so there's no difference. Evolved Kobold was used back in the day mainly for combo Freeze Mage, a dek that no longer exists after Ice Block rotated. I honestly feel like Celestial Emissary does the job better while also being a lot more flexible. Although maybe the key to the new mage spells is jsut running all the spell damage cards together. Great. They made minion mage a thing and now they will boost another archetype for the class. I really like the way it was planned for us this year.